by priority (high, normal, low), project completeness (done, half-done, planned), project status (approved, rejected, pending) and type of information (work, important, temp, private). Find files faster with just 2 mouse clicks! "Mac users have been enjoying file and folder color-coding for years and now I am able to do the same on my PC with File Marker. Cool." FileMarker.NET is easy-to-use tool that enables Windows users to arbitrarily change separate file icon images and mark files with additional sub-icons to reflect their completeness, status, priority or type. The program allows you to color-mark a file, or add a label to it, or use a combination of a color and a label. Using the program is extremely easy - the customizable context menu is opened by right-clicking the necessary file. Custom file icons are applied immediately after the user selects the corresponding command. 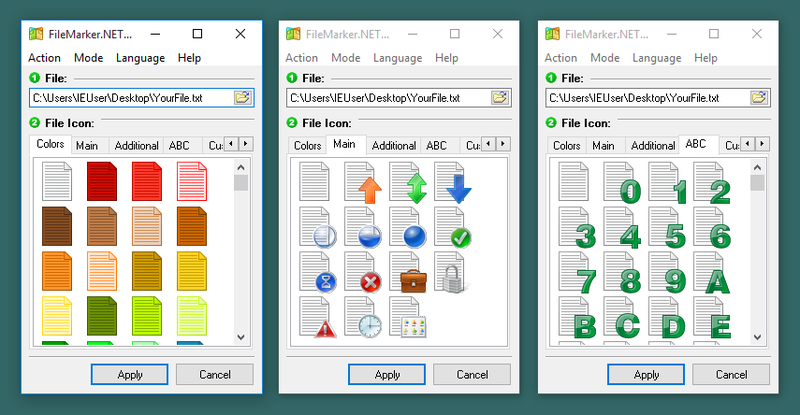 With FileMarker.NET, you can even copy or move files with customized icons to another system with a copy of the program installed - and the original appearance of the files will be completely preserved. FileMarker.NET is a compact, intuitive and easy-to-use Windows file icon changer. Choose your file, choose the icon for it, and click Apply button. That's it! FileMarker.NET makes it easy to mark files. All you need to do is right-click on the file you want to mark and select the color or icon you want from the popup menu. FileMarker.NET Pro license allows to use the software in your office. FileMarker.NET Pro can customize one file or multiple files together. FileMarker.NET Pro contains 16 professional icons for office work, plus 36 marks with letters and numbers build-in. FileMarker.NET Pro can mark folders by priority (high, normal, low), by degree of work complete (done, half-done, planned), by work status (approved, rejected, pending) and by the type of the information contained in a file (work files, important files, temp files, private files). FileMarker.NET Pro can change a files's color to normal, dark and light states. 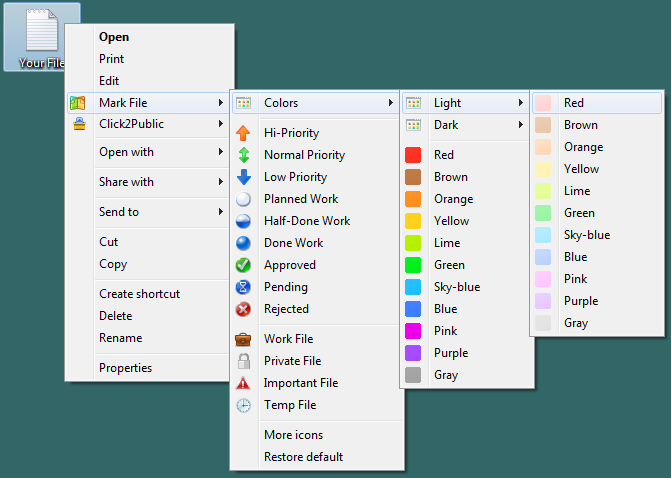 33 color variations for professional file management. FileMarker.NET Pro changes file icons from within a popup menu of the files. To mark a file, you don't even need to run the program! Ready to Make Your Files Unique & Tasks Prioritized or Just Save Time on Finding Files?